Dan Leach, author GEORGE BIRIMISA, unknown spectator, “Daddy Violet,” 1967. 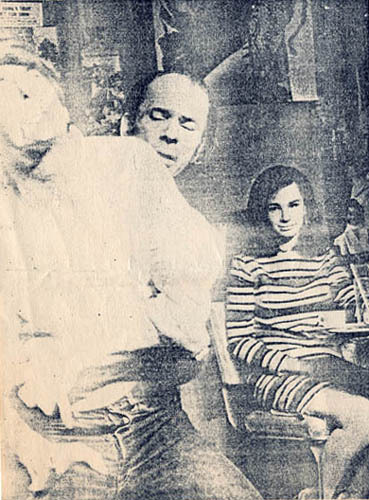 Dan Leach, authorGEORGE BIRIMISA, unknown spectator, “Daddy Violet,” 1967. Click on a photo to see detail. >>>LANFORD WILSON, 2008 hour-long interview. Click on the link that says "Download Audio (mp3)"
>>>Buy MICHAEL SMITH's generously-illustrated memoir of Cino lighting-genius JOHN P. DODD. >>>GEORGE BIRIMISA: personal blog of playwright of Cino play "Daddy Violet"
>>>Writer/actor/manager JOHN BORSKE's exciting bio. >>>"IN THE LIFE" PBS: Caffe Cino Artists Extensively Describe the Cino Experience and the birth of gay theatre there. ANNOTATED by Robert Patrick. >>>"IN THE LIFE" Video: DORIC WILSON and Edmund White on Stonewall, Gay Plays, and the Cino. >>>"VAPORS": Clip of Cino actors in Andy Milligan movie written by Hope Stansbury. >>>Cino Actor NORMAN THOMAS MARSHALL's "John Brown" monologue. >>>CINO PLAY COMPLETE: LANFORD WILSON's mini-play "Wandering," 2007 school production. >>>CUNY TV: Off-Off Broadway, Parts 1 & 2: William M. Hoffman interviews four Cino luminaries. >>>DVD LECTURE: "Caffe Cino — Birthplace of Gay Theatre." >>>PLAYWRIGHT GEORGE BIRIMISA remembers the Cino and some early gay plays. >>>SLIDESHOW: Stills of filmmaker Mark Waren interviewing Cino People for a proposed documentary. >>>SONG FROM CINO SHOW "PSYCHEDELIC FOLLIES"
>>>SUKI WESTON's paintigns of early- and middle-period Off-Off people. >>>TOM O'HORGAN shows Mister Rogers his exotic musical instruments.